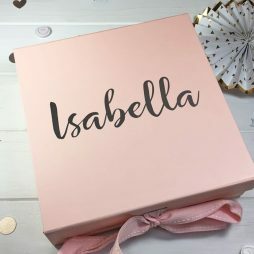 An elegant personalised gift box to fill with your choice of gifts especially for the Mother of the Bride. 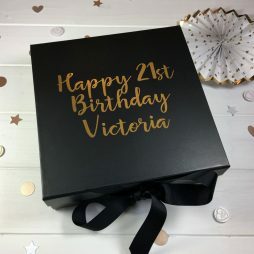 Personalised with the name of your choice, there is also the option to include a surprise message inside the box lid (+£2). 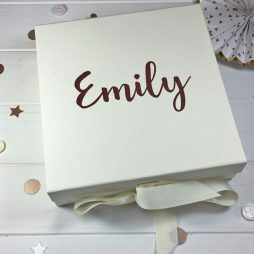 A luxury personalised gift box to fill with lovely gifts to present to each of your bridesmaids. 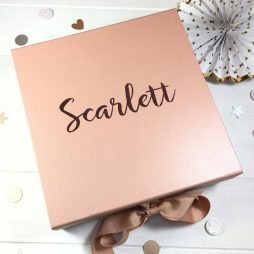 Personalised with the name of your choice, there is also the option to include a surprise message inside the box lid (+£2). 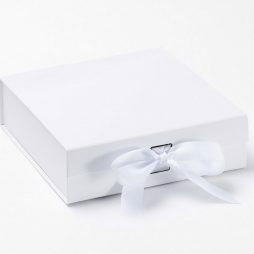 A luxury gift box to fill with lovely gifts for your maid of honour. 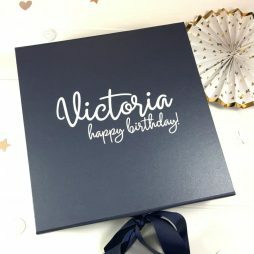 Personalised with the name of your choice, as well as the option to include a surprise message inside the box lid.(+£2). 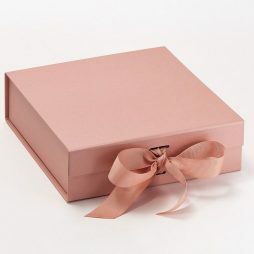 A luxury gift box to fill with lovely gifts for your maid of honour. 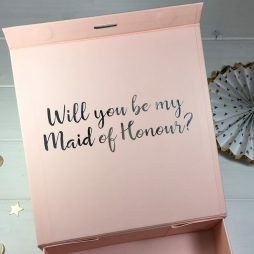 Personalised with the name of your choice, as well as the option to include a surprise message inside the box lid, for example: “will you be my maid of honour?” (+£2). 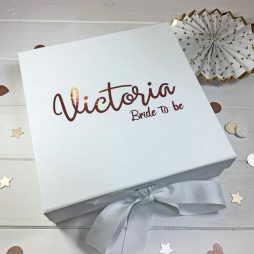 This is a beautiful memory box to give to the bride to be, fill with gifts or leave empty to add keepsakes and memories from her special day. 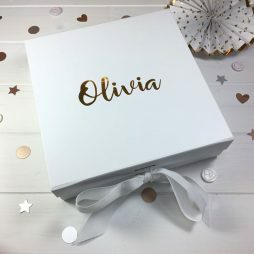 Personalised with the name or words of your choice, there is also the option to include a surprise message inside the box lid, for example: “to my beautiful bride” (+£2). 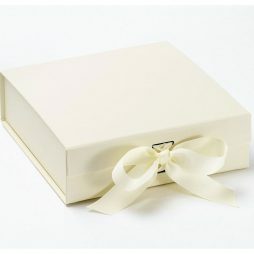 This elegant gift box to fill with gorgeous gifts for your Maid of Honour. 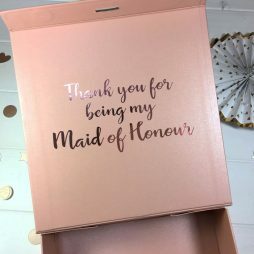 Personalised with the name of your choice, there is also the option to include a surprise message inside the box lid, for example: ” Thank You For Being My Maid of Honour” (+£2). 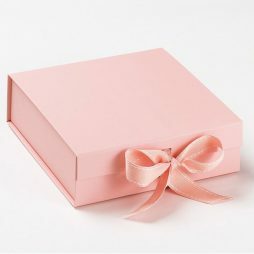 An elegant gift box to fill with lovely gifts for each of your bridesmaids. 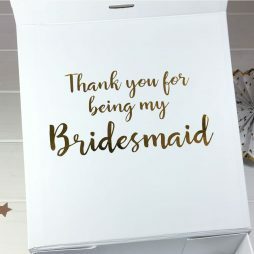 Personalised with the name of your choice, there is also the option to include a surprise message inside the box lid, for example: ” Thank you for being my bridesmaid” (+£2). 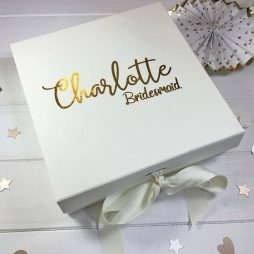 A luxury gift box to fill with lovely gifts for your bridesmaids. 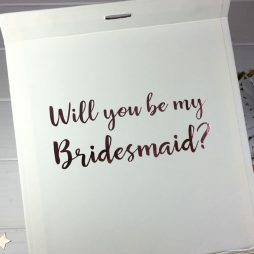 Personalised with the name of your choice, there is also the option to include a surprise message inside the box lid, for example: “will you be my bridesmaid?” (+£2).